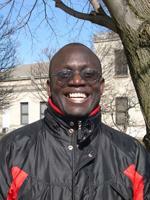 Vincent de Paul Obade, PhD. develop new operational models for assaying soil and water quality using cutting edge technology and novel algorithms. examining barriers in data analyses, and information delivery for monitoring efforts. health-risk maps for ecosystems and habitat suitability indices. poverty assessment using spatial information techniques. investigate effective approaches for disseminating critical scientific findings to the public and policy makers.